In renewed condition throughout with only 2400 hours on the engines, the yacht presents superbly throughout the interior. The exterior is undergoing several cosmetic upgrades including replacement of all wooden tables. The yacht is in full operable condition and is maintained by a permanent crew. Rina A1 Class valid to 2019. United Yacht Sales New Jersey would love to guide you through a personal showing of this 97' Azimut 98 Leonardo 2009. This yacht for sale is located in Dubai United Arab Emirates and priced at $3,350,000. For a showing please contact us by filling out the form on this page and we will get back to you shortly! The yacht is entered from the stern using the electric pasarelle arriving at the large aft seating area suitable for relaxation and dining.Main SalonThe huge main salon is enter via deck wide sliding opening doors. This enables the main solon to be either totally protected from the elements or fully openable to enjoy the best of the weather. To starboard are the easy access stairs leading to the flybridge followed by storage units and the pop up TV system.At the rear of the lounge is a large circular dining table which seats 8 guests followed by large comfortable sofas. Before the closable helm station is a bar with sink, fridge and ice maker. Forward is the helm station and to port is the stairs to the crew and galley area.Helm StationThe helm station is bright and practicable offering excellent visibility for manoeuvring. Three race car style high back chairs are in the centre enabling immediate access to all controls. 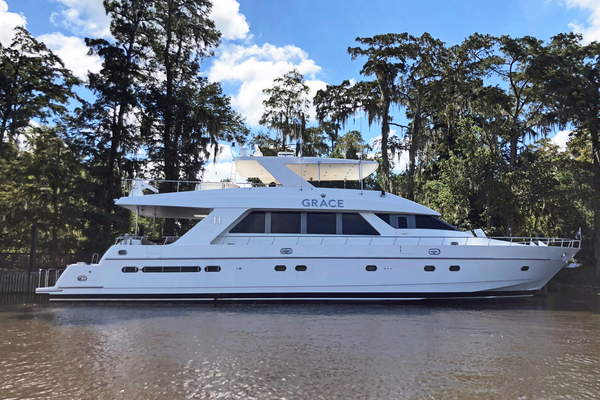 To port is a mini office / Captains area and to starboard is the door leading to the foredeck.Guest AreasThe lower deck comprises of 4 cabins, aft is the owners suite with large bathroom and seating area to starboard. Forward is the full bean ViP cabin with private bathroom. Between the two are two twin cabins, both with en-suite bathrooms one of which serves as a day head for guests through separate door,FlybridgeThe flybridge is exceptionally large for a yacht of this size and to starboard is the second helm station with all major control systems repeated from the main deck bridge. There are extensive seating and sunbathing areas incorporating a large jacuzzi aft and barbecue to port, with a large dining table midships. There is a bar with fridge and ice maker. Automatic life rafts are positioned to port and starboard.BowThe bar includes a very large sunbathing and seating area with foldable tables, perfect for quiet cruising while entering a new port. Forward is a working area with anchor equipment etc.Crew AreaThe crew area includes a large galley to serve all guests and a laundry area. There are two twin cabins for 4 crew. The engine room can be accessed through the crew area. The galley is fully equipped and includes two very large fridge/freezers.Engine RoomThe engine room is well laid out and easy to work in with access to both crew area and stern garage.Stern GarageThe garage is very large for a yacht of this size and includes a Williams jet tender and room for two jets skis.